At the beginning of 2005 I weighed 180 pounds. I was determined to shed twenty of those pounds in time for my birthday in October. And I did! 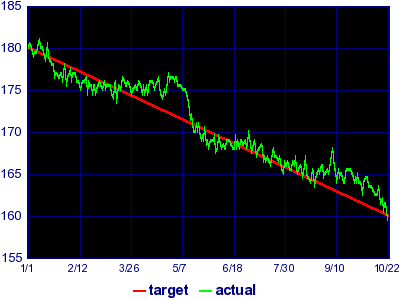 The red line in this graph was my daily goal and the green line was my actual weight, which I measured faithfully under identical conditions each day. By the end, not only was I getting compliments on my improved appearance, but my occasional asthma and reflux problems had disappeared and my clothes fit better. I did it by eating much more sensibly (n.b. not “dieting”) and by committing myself to riding my bike a few times a week. In fact, via this modest common-sense program I got lean and strong enough by September to make a decent showing in the “Great SF Bike Ride” preceding the San Francisco Grand Prix bicycle race. Of course I celebrated with some birthday cake — not just on my birthday, but on each of the several days that followed, as there was plenty left over. Halloween followed soon thereafter, and I wasn’t about to let my kids eat all that candy themselves, now was I? Naturally I stuffed myself on Thanksgiving, and then it was the Christmas season with cakes, cookies, and candy everywhere. My discipline was destroyed. By March I was back up to 170. By yesterday I was back up to 180. I look and feel terrible. My pants are too tight. My asthma and reflux are back. Today I had to run to catch a train and all but collapsed in a gasping heap after two blocks, watching the train disappear into the distance. So today begins a new campaign: to reach 150 by my birthday in 2007. You can follow the progress in the graph at the bottom of the sidebar on the front page of this blog. I eagerly await publication of the PoppaDroppaPlopo’Blubba Diet Plan.